The International Motorcycle Show in Dallas was full of people, products, lots & lots of bikes, and plenty of excitement! Most of the manufacturers brought impressive large displays, with Honda and KTM being noticeably the odd men out. Attendees missed having these two manufacturers at the event and some decided not to attend because of their absence. Oddly enough, Victory was there in force despite Polaris’s decision to discontinue the motorcycle line in favor of the Indian brand, which was also represented. Yamaha displayed front and center covering a large amount of floor space with motorcycles from every genre. Suzuki & Kawasaki also brought all their impressive hardware, with a full complement of very knowledgeable staff on hand to converse about or explain the models & many new features. 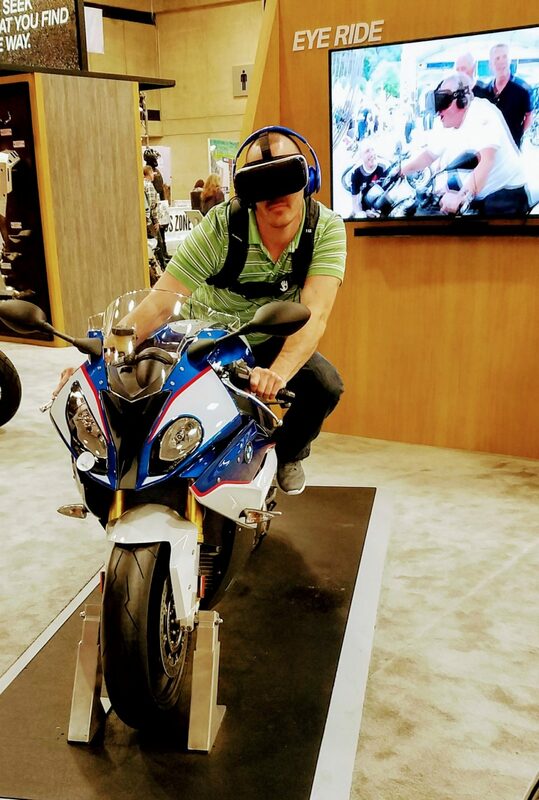 Notably BMW’s high tech displays included a virtual reality ride that allowed you to sit on a BMW with virtual reality glasses and headphones and take a ride on “Eye Ride.” It provided an exciting ride for those game enough to mount up and entertainment for onlookers as the rider visibly responded to an exhilarating “ride”. We think this emerging technology is very good for motorcycling in general. It will allow any non-rider to quickly, and safely experience some of the sensations of rolling along on a bike, without ever even having to put on a helmet! As an experienced rider, one of the things that is most exciting could be how much it helps in the teaching areas of riding. Being able to sit on a real bike, then take some virtual ride experiences, with verbal instructions and prompts piped right into the headsets…should be a big boost up for riders of any level if they find themselves struggling with conquering a particular technique, or style of riding. Being able to “pre-prime” your mind with familiarity due to already virtually seeing and experiencing the sensations should make learning much easier. It isn’t easy to commit and execute in real time on the bike, if you aren’t sure of what you are trying to accomplish and exactly how you intend to go about it. We look forward to exploring more about this on Outdoors With Wheels Radio in the future with our friend Joe Martin who is a native Houstonian, international adventure rider, and emerging technology expert. In addition to traveling the globe extensively on a bike, Joe is all about promoting and growing opportunities for the virtual ride experience. There was a wide variety of gear and accessory displays complimenting the manufacturers displays. The vintage motorcycles and custom builds were scattered throughout the show. One builder truly caught our attention with his low budget, but truly amazing bike. Here is a quick look at his bike…more to come in future episodes of Outdoors With Wheels Radio. There was a wide variety of gear, accessory, rider services, and outfitter booths complimenting the manufacturers displays. The vintage motorcycles and custom builds were scattered throughout every corner of the show. One builder truly caught our attention with his low budget, but utterly amazing bike. Here is a quick look at his bike…more to come in future episodes of Outdoors With Wheels Radio. The Metal Mulisha riders from the Fitz Army – Jimmy Fitzpatrick, Matt Buyten, Cal Vallone, and Jesse Jolsen join the Outdoors With Wheels crew to discuss how they perform those adrenaline rich motor cycle high wire acrobatic stunts, also how their bikes are modified and set up so they are able to perform these incredible feats. Erin Sills discusses how thrilled she is to ride faster than any human ever on bikes, having already set 20 various land speed records in multiple bike sizes and categories! And when you hear her talk, one gets the sense that she is only warming up, with many more still to come. Her energy & enthusiasm for riding is absolutely infectious. She also is an off road riding instructor at Rawhide who teaches a women only riding course. Never content with only past accomplishments, she strives to put more women in the sport. She and her late husband formed the Hunter Sills Race Team some years back, and started a scholarship dedicated to promote and assist outstanding female riders. Learn about the Christian Motorcycle Association straight from their Vice-President’s mouth. These folks are the “real deal”! They are riders thru and thru who also have faith, and a commitment to share their love of two wheeled bliss, or their faith in Christ with all who would care to ride along… whether they are believers, or not. Alaskan native Phil Freeman’s travels through this wild and untamed state and the development of Motoquest from meager Alaskan backwoods startup to expansive global motorcycle tour company. We also visit at length with reps from highly acclaimed gear manufacturer Klim, and they share some behind the scenes development information. John Bettencourt of Heidenau Tires USA brings a wealth of knowledge and insight about those round rubber grippy things on our bike rims which seem to need constant replacing. We dig under the tread with John to learn more about the legendary brand that enjoys the title of “toughest tire carcass in the business”.